Blizzard’s Diablo page on Facebook clicked past 650,000 “likes” this morning, and this evening our pimpage was rewarded with a new artwork. It’s concept art this time, of the cute and cuddly treasure chest on legs, the Treasure Seeker. 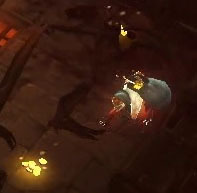 As the devs delight in saying, when you spot this guy in a dungeon you should “beat the candy out of him,” since he drops gold as he runs, and progressively better items as he nears death. You can see more info about him, along with other art assets and screenshots, on his wiki page. I enjoyed interacting with the Treasure Seeker in the Blizzcon 2010 demo, but his AI still needed some work. He was great for a melee character; devilish, since he runs faster than you can, but only in bursts. He stops often, giving you a chance to catch up, but then squirts away again after you take a couple of swings, and he’s very good at running you right into packs of monsters. For a ranged attacker though, he was a freebie. I got him in different games with a Demon Hunter and a Wizard, and cut him down in about five seconds both times, since he didn’t seem to know to run unless I was very nearby, and his evasive, erratic side to side movement meant nothing to my Magic Missiles. Not to mention his vulnerability to Bolo Shots after being Entangling Arrow‘ed. He needs better AI to deal with ranged attacks, or maybe a shield or some kind of inherent blocking ability. 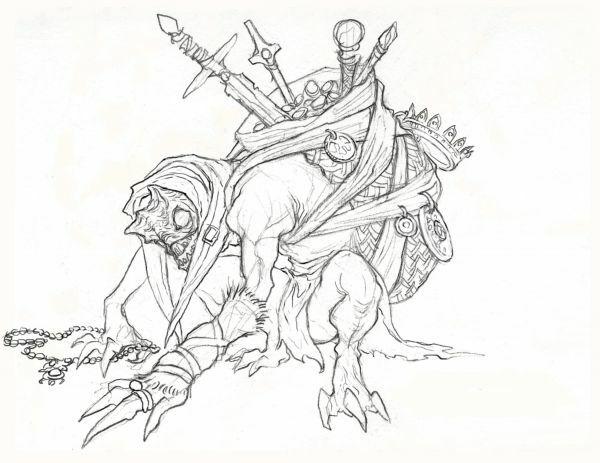 Given the huge bag of treasure on his back and the fact that he’s running away from you, you’d think blocking would be easy to manage. It would also be nice if he made some goat-y sound effects. 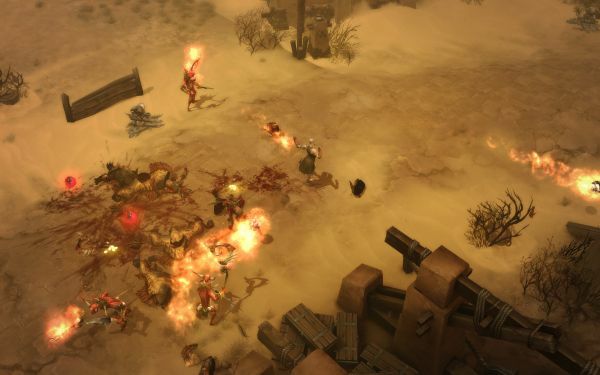 He’s not a goat, as his wanted poster artwork makes clear, and he has some cute grumbly/goblin type vocalizations, but Gharbad flashbacks are unavoidable for Diablo I players. Update: A new screenshot was also released to the fansites as well (it’s not on Facebook yet) and you can see it below. It’s a nice battle scene, evidently taken a few seconds after this previous one. The male Monk has devastated the Fallen Shaman and their Fallen Hounds, and now presides over an ensanguined expanse of desert. Having broken the backs of his opponents, the Monk is now taking a moment to pose and laugh, taunting the few surviving shaman as they stumble miserably over the savaged corpses of their loyal pets, struggling futilely to prolong their worthless lives. Diablo Fan Art Watch #80: Duriel - Looking for Baal?